260 р. Average price online * 260 р. 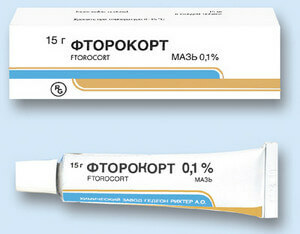 The ointment is applied externally, applying a thin layer to the affected skin. This should be done no more than 3 times within 24 hours. 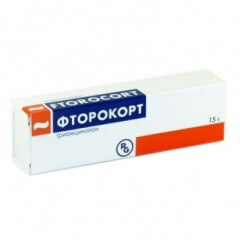 The amount of ointment per day should not exceed 15 gr. The use of an occlusive (airtight) dressing is acceptable. The treatment course in most cases ranges from 5 to 10 days. In the case of a persistent course of the disease - no more than 25 days. 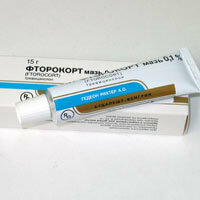 Prolonged use of Fluorocort, like any other corticosteroids, can cause serious side effects. malignant formations and precancerous skin diseases. Fluorocort is not prescribed to those patients who have experienced syphilis with pronounced skin manifestations. During pregnancy and breastfeeding, the drug is contraindicated . Children under 6 years of age are contraindicated . Local side effects are not excluded, in particular: erythema, hypertrichosis, secondary infectious lesions of the bacterial or fungal type. With prolonged use or application to large areas of the skin, such side effects are likely that are characteristic of all SCS, for example: insomnia, anxiety, adrenal insufficiency, secondary immunodeficiency, steroid diabetes, Cushing's syndrome, arterial hypertension, myocardial dystrophy, cardiac arrhythmias , edema, muscle weakness, muscle atrophy, osteoporosis, steroid stomach ulcers, intestinal atony, tendency to thrombosis, skin atrophy, allergic reactions. 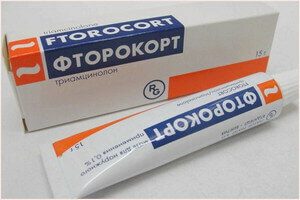 The main component of the ointment is triamcinolone acetonide. The main component is a topical glucocorticoid, when used externally does not have a significant systemic effect, since almost does not enter the bloodstream. Cracks or scratches on the surface of the epidermis, as well as an occlusive dressing may increase the degree of absorption of the substance. To store at a temperature of 8-15 degrees, avoiding hit of moisture and direct sunshine, in the place, inaccessible for children. Shelf life is 2 years. Do not apply ointment on large surfaces. It is recommended to avoid prolonged use by children, regardless of age. Undesirable or applied to the face, especially in the eye area. In order to prevent infections, it can be used in combination with antimicrobial agents.